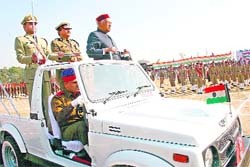 The Haryana Governor, Dr AR Kidwai, unfurled the National Flag at a state-level function held to mark the 60th Republic Day in Rao Tula Ram Stadium here yesterday. Republic Day at Rao Tula Ram Stadium in Rewari on Monday. Maharshi Dayanand University today attained the status of a Wi-Fi campus with the commencement of an integrated telephony and Internet system. Chief Minister Bhupinder Singh Hooda inaugurated this facility at a function organised in the university central library. Five persons of a family, including three women, tried to commit suicide by consuming pesticide here today. They were immediately admitted to the local LNJP Hospital. A woman died while her baby girl sustained injuries when they were attacked allegedly by her husband at their house in Bhaini Chanderpal village in Meham subdivision in the district last night. The accused also made an attempt to commit suicide. Additional District and Sessions Judge JS Dahiya today sentenced a Naib Tehsildar, his wife and a son to imprisonment for life and imposed a fine of Rs 5,000 each on them for the killing of the officer’s sister-in-law. Widow in US getting pension from Sirsa! A woman in the US has been getting her widow’s pension from Sirsa! It sounds strange but it is true. President of the Haryana Jat Arakshan Sangharsh Samiti Devi Singh Tewatia today demanded that the state government should accept and implement the recommendations of the Gurnam Singh Commission for giving the Jats in Haryana reservation under the OBC category. Special Judge of the CBI, Haryana, AK Verma granted bail to a woman accused in the kidney scam here today while the bail applications of five other accused were dismissed by the court. The district authorities issued senior citizens identity cards to the first batch of senior citizens in Soolikhera village here today. Confed has decided to revise the pay scales of its employees as per the recommendations of the Sixth Pay Commission. Paying tributes to martyrs and freedom fighters, he said it was simply due to their supreme sacrifice that today people were living in the unfettered environment of independent India. Enumerating various programmes and projects launched by the state government for the welfare of women, children and other weaker sections of society, he said the budget allocation for the SCs and BCs had been hiked from Rs 16 crore to Rs 130 crore. He also honoured relatives of late Abhishek and Suraj (Gurgaon), Babita, Amarjit (Sonepat), Nitin Ranga (Fatehabad), Siddharth( Bhiwani), Jogi Ram (Panchkula), Padma Shri awardee Dr Surrender Singh Yadav and Dr SN Saxena (Rewari) for their outstanding performance in different spheres. The Governor announced a cash prize of Rs 1,01,000 to schoolchildren, who participated in the Republic Day celebrations. GURGAON: Haryana Chief Minister Bhupinder Singh Hooda unfurled the Tricolour at a ceremony organised to mark the country’s 60th Republic Day here on Monday. Earlier, the Chief Minister paid tributes to martyrs by laying a wreath at the War Memorial on the premises of John Hall and honoured the war widows and freedom fighters. Hooda disclosed that a project costing about Rs 2,000 crore was being implemented for improving the condition of roads in the state. He announced that in a step towards women empowerment, the Haryana government had decided to establish “mahila shakti sadans” in all villages of the state. He said 60 per cent work of extension of the Metro Rail project up to Gurgaon had been completed, adding that the Metro Rail service would be extended up to Faridabad and Bahadurgarh. The Chief Minister also announced a sum of Rs 2 lakh for distribution of sweets among the schoolchildren. He honoured 26 residents of Gurgaon for their outstanding achievements in various fields. KURUKSHETRA: Unfurling the National Flag at Dronacharya Stadium here on Monday, Haryana Education Minister Mange Ram Gupta highlighted the developments made by Haryana during the Congress regime under the able guidance of Haryana Chief Minister Bhupinder Singh Hooda. JHAJJAR: Chief Parliamentary Secretary Rao Dan Singh unfurled the National Flag on the premises of Government Polytechnic Institute here on Monday. As many as 59 persons were honoured by the district administration for their commendable job in the fields of education and social service. SONEPAT: As many as 75 persons, including NSG commando Sukhbir Malik of Bidhal village, nine freedom fighters, six sportspersons, 26 government officers, 11 social activists and 22 others, were honoured at a district-level Republic Day function by Haryana Health Minister Kartar Devi for their outstanding performances in various fields. YAMUNANAGAR: State Tourism and Forest Minister Kiran Choudhry said the country should stand united to fight against social evils like terrorism and corruption. She said this while addressing a gathering at the Republic Day function in Tejli Stadium here on Monday. KARNAL: Haryana Power and Public Health Minister Randeep Singh Surjewala unfurled the National Flag at Karan Stadium here on Monday. The minister also distributed 25 tricycles to handicapped persons on behalf of the District Red Cross Society. SIRSA: Parliamentary secretary Dillu Ram unfurled the Tricolour here on the occasion of the 60th Republic Day on Monday. He took salute of the parade and honoured several persons, who had excelled in their respective fields. Parliamentary secretary Dura Ram hoisted the National Flag in Dabwali town. FATEHABAD: Chief parliamentary secretary Ramesh Kaushik unfurled national flag in the local police lines on Monday. Cultural items were presented by students of various schools and colleges. Hooda said Indian universities lagged behind due to poor research and development. He said the introduction of a Wi-Fi campus and integrated Internet services would boost research and development in the MDU. He congratulated the university authorities for this initiative which, he said, would facilitate e-governance also. He said that this facility might be extended to the Pt BD Sharma University of Health Sciences too. Speaking on the occasion, MDU Vice-Chancellor RP Hooda said the university was committed to providing an excellent academic environment and state-of-the-art facilities to the students, research scholars and faculty members. The Wi-Fi campus was a step in this direction. Earlier, Dr SK Bedi, Professor, IMSAR, spoke about the features of this integrated telephony and Internet services. He claimed that the MDU had now become the largest Wi-Fi campus in Haryana. They have been identified as Prakash (27), Tinku (24), Neha (16) and Varsha (18), children of Laxmi, and Malti (24) daughter-in-law of Laxmi, all residents of Dhakka Basti here. Three of them, including Prakash, Malti and Neha, were referred to the PGI, Chandigarh, in the morning while the rest of them were sent in the afternoon. The police had registered a case against Laxmi and one Rajesh under Sections 366-A, 372 and 511 of the IPC for allegedly procuring a minor tribal girl from Bhopal, Madhya Pradesh, and trying to sell her locally for the purpose of marriage. They were arrested and sent to jail. Tinku gave an application to SP KV Ramana alleging that his mother Laxmi and Rajesh had been falsely implicated by some persons, following which the SP directed DSP Kamal Deep for a thorough inquiry into the matter. Meanwhile, Tinku also approached mediapersons and gave a threatening letter to commit suicide by family members. Ramana said the case was registered 5-6 days ago and in response to the application from Tinku, an inquiry by the DSP had been ordered. Meanwhile, the family members took the step, he added. Civil surgeon Praveen Garg said as per information gathered from the PGI, Chandigarh, the condition of all five family members was said to be stable. The woman has been identified as Aarti. Her daughter is reportedly three-week old. The accused, Hawa Singh, has been admitted to the PGIMS. A case has been registered in this connection. The police suspects infidelity and dowry as the the reason behind the incident. A complaint has been lodged by the victim’s father against the accused. The victim, Lali Devi, a widow, had died on April 23, 2006, and it was alleged that her sister Dhanno Devi, brother-in-law Chand Ram, a Naib Tehsildar, and the couple’s son Jatinder had killed the woman after a dispute over a residential plot. The victim’s son, Ravi, had told the police that his mother had gone to Chand Ram’s house in the morning of April 23 after he called on their phone and asked to accompany them to Charkhi Dadri to meet a kin. Later, Chand Ram allegedly called Ravi on his phone within two hours of his mother’s departure and told him that his mother has met with a cardiac attack. Ravi told the police that when he reached the hospital, Dhanno Devi and Jatinder were standing near the body placed outside the hospital. They escaped from the scene on seeing him. Later, the police found that the victim had been throttled by the accused. Joginder Kaur, widow of Jagmal Singh of Amritsar Kalan village in this district, has been getting the widow’s pension on a regular basis though she is in the US for the past three months. Village sarpanch Sukhdev Singh, whose duty it is to disburse the pension released by the District Social Welfare Department, has been showing the money delivered to the widow against “her thumb impressions”. The matter came to light when a villager, Maluk Singh, gave a written complaint to District Social Welfare Officer Alka Yadav earlier this month, who not only stopped the disbursement of the pension in the future, but also ordered an inquiry. Both the complainant, Maluk Singh, and the sarpanch recorded their statements before the officer today. While Maluk Singh affirmed his earlier stand, the sarpanch maintained that he had delivered the money to the widow’s son, Sucha Singh, who was also present in the office during the inquiry. Sucha Singh, however, denied that these were his thumb impressions. However, he agreed that his mother had been staying out of the country for the past three months. Alka Yadav said she would send the thumb impressions to the forensic science laboratory at Madhuban for examination. She said earlier a complaint of delivering pension to a person, who was dead, was also received against the same sarpanch. Talking to mediapersons here, Tewatia alleged that former Chief Minister Bhajan Lal did not accept the recommendations of the commission and the Jat community remained deprived of their right to reservation because of its socio-economic conditions. He announced that the samiti would urge the Jat voters in the state to vote in the coming Lok Sabha and assembly elections for only those political parties which accepted the demand of the community. Linda was arrested by the CBI around a year ago from Gurgaon after the kidney scam came to light. Earlier, Linda was employed in Ram Manoher Lohia Hospital in Delhi. She belongs to Manipur. She had been in Ambala Central Jail in judicial custody for the past one year. The judge dismissed the bail applications of Dr KK Aggarwal, Dr Serj, Dr Upender, Jagdish and Manoj, all accused in the kidney scam. The authorities claimed that Fatehabad district was the first in Haryana to have started the distribution of identity cards. Deputy Commissioner JS Ahlawat distributed cards to as many as 70 senior citizens in the village. The laminated identity cards having the photographs of cardholders are being issued to all individuals above the age of 60 free of cost by the Social Welfare Department. The cards would entitle the senior citizens to access certain schemes of the government. Chairman of Confed Bajrang Das Garg said here today that the salary to the Confed employees for January 2009, to be paid in February, would be given as per the pay commission report. He said the pay would be revised with retrospective effect from January 1, 2006, and arrears would be paid according to the government policy. Garg said Confed had been making profits, as a result of which it donated Rs 51 lakh to the Chief Minister’s Relief Fund. He said the previous government had decided to close Confed and retrenched its 678 employees but the present government had adjusted the retrenched employees in various departments.